This book is unique. I love unique. Cheri Gamble has a fun parable style. She tells a little story from her life and ties it to the spiritual. These aren't a cheesy, “Praise God for helping me tie my shoes today” type of stories. Not that some of us don't need help with some of the simplest things sometimes, like when I was expecting and couldn't even see my feet much less reach them to tie shoes. Thank the Lord for slip-ons! If you've read very many of my reviews, you know I like thought provoking books. I like things to stimulate my mind and help me consider different perspectives. "Isn't it incredible how God can take something so ordinary, such as duct tape, and turn it into something extraordinary for the Kingdom? In His hands, even the most ordinary household object can become a tool that can be used to advace the kingdom if there is someone willing to do the work." ﻿Banana Bread & Mismatched Socks: 100 Devotional Thoughts From My Every Day Life is a collection of stories that will help bring us closer to the Author each and every day. Combining the stories of her life with ultimate truths supported by Scripture, Cheri Gamble has provided 100 daily devotions that will challenge, encourage and inspire us to focus less on the circumstances of our lives and more on the overall theme -- a theme that showcases a loving Father who wants us to trust Him to turn our own stories into His own Masterpiece! Wherever you are in your journey in life, this book will help you draw closer to the Father as you spend uninterrupted time in His presence. Katie and her husband are missionaries in Mexico. We have become close blog-mom-friends. Her family is absolutely amazing. She has a wonderful website full of fun resources and uplifting encouragement. Katie is also an author and speaker to both English and Spanish speaking fellowships. ﻿This site is new to me and I'm so glad they linked up! Here's their vision: "Fun With A Message is a long awaited dream to use our talents and our time to help organizations serving children in need. We founded Fun With A Message as a giving business: a portion of every sale will go to one of the charities we support." They sport a gift shop with fun stuff and a site full of ideas and inspiration! I linked up this post at "The Homeschool Mother's Journal". There are some great posts linked up there. I encourage you to visit them. Thank you for featuring my post, it was a hard one to write for me! Thanks for hosting! You did a wonderful job! Our whole family enjoyed reading it. Made for great discussion. Thanks for linking up! Thanks so much for such a great review! I pray that this book will challenge and encourage many people as they grow closer to Jesus! I pray the same. It's a wonderful read! Exciting! A new book to add to my (ever-growing) list. Thanks for this review - and thank you so much for linking up at Front Porch Inspired. 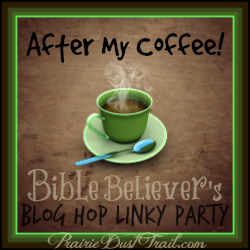 It's a new link up, and I so appreciate all of you who jumped in. I hope to see you again this Thursday! I was glad to return the favor! I love linky parties!